Once in a while there comes an album that is so musically perfect and so in tune with its times that you know on one listen that it is destined to be a classic. Such is Freedom Highway, the second collection that Rhiannon Giddens has released under her own name. Its songs are drenched in her country’s history while speaking directly to its troubled present. There is horror here, but inspiration too. Thea Gilmore seemed surprised that so many people had turned up to see her – enough to fill the Epstein Theatre – on the same night that Dolly Parton was doing her thing down at the Arena. But Thea’s fans are nothing if not loyal: when she asked how many members of the audience had previously attended one of her gigs, the response was pretty well unanimous. For myself, as the links at the foot of this post reveal, I’ve seen her on several occasions now, and been a fan of her music since the late nineties. Indeed, Thea was in reflective mood last night, musing over the fact that it’s been 17 years now since she recorded her first album – at the age of 17. With no new album to promote, she was free, she said, to play what she liked, and to range over her extensive back catalogue. So what we got was a selection of old favourites and some classic cover versions. No-one, I think, does cover versions as good as Thea’s, except, perhaps, Bruce Springsteen. As usual, her husband and producer Nigel Stonier accompanied her on guitar and keyboards (he had also opened the show with a supporting set of numbers from his new album – the best of which was an old song, now re-worked, ‘Messin’ With Fire‘, which he originally wrote with the jazz vocalist Clare Teal. Apart from Stonier, Thea’s current band makes an unusual line-up – in addition to Stonier, there’s Liz Hanks on cello and Susannah Simmons on violin. Oh, and 7-year old son Egan on fiddle for a couple of numbers at the end. Thea opened with two numbers from 2002’s Songs from the Gutter – ‘And We’ll Dance, taken at a much faster pace than on the album, and ‘Tear It All Down’. 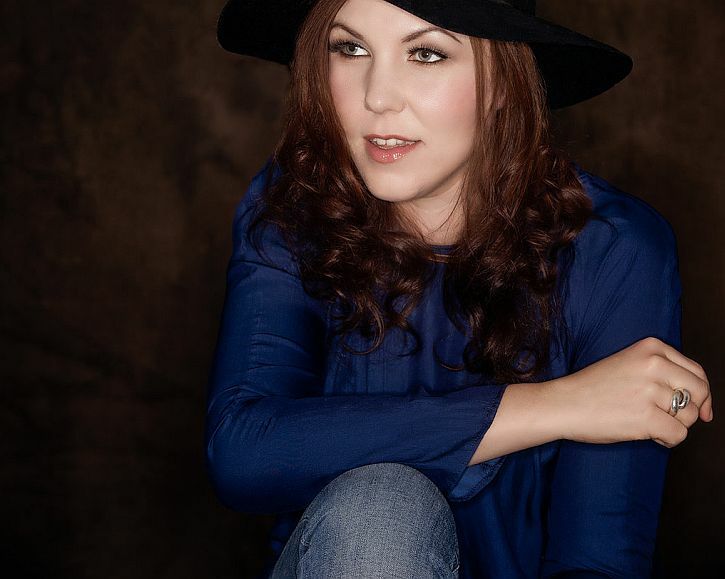 Then came a superb cluster of songs – ‘Old Soul’, one of my absolute favourite Thea Gilmore songs, followed by the superb version of ‘All You Need Is Love’ which she recorded for a Mojo magazine cover mount. Slowed-down and with all the orchestration stripped out, it’s a brilliant interpretation. She sang it at the Hillsborough Justice gathering before the new inquest began; after singing it at the Epstein she said how nervous she felt singing it in this city. She needn’t have worried. After that came ‘This Road’, the beautiful song from last years Regardless album which, as Thea explained, she wrote as an expression of love for her children: ‘this road is the only one worth walking’. Two more outstanding moments were interpretations of songs by others – David Bowie’s ‘The Man Who Sold The World’ and an exquisite reading of George Gershwin’s ‘Summertime’. We left the Epstein fired up by a great concert, with the rousing choruses of the final encore, ‘Are You Ready’, ringing in our ears. Thea Gilmore with strings: mainstream or lightning? I travelled the country for eight years, criss-crossing America in a Guthrie-esque way, seeing the nation and its citizens up close, learning the best ways to listen and to communicate. When I was organizing local communities to fight back against multinational corporations, I would start our open public meetings with a song, figuring that unifying people in singing was an important first step to unifying them in political action. 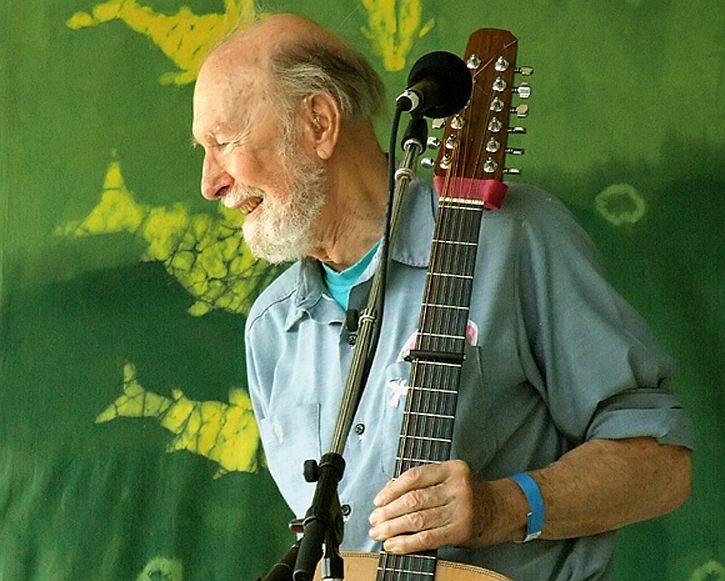 In 1997, for Appleseed’s first major project, Musselman approached numerous well-known musicians, along with writer Studs Terkel with a request to each record a song written, adapted or performed by Pete Seeger for a tribute album to highlight Seeger’s musical contributions and his tradition of mixing songs and political activism. 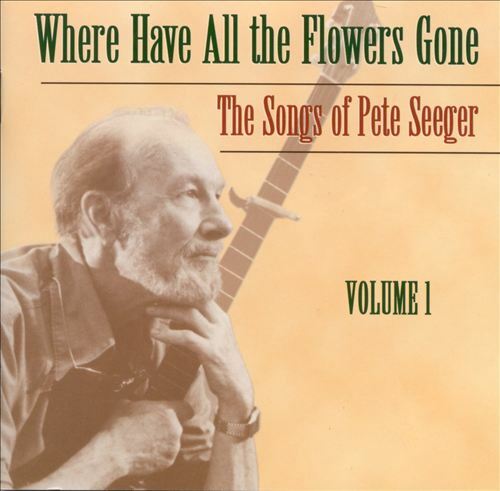 The resulting double CD Where Have All the Flowers Gone: The Songs of Pete Seeger was the one I stumbled across as I followed internet references to Seeger in the days after his death. It’s a terrific album from which you gain a holistic sense of the man and the causes he embraced. Jim Musselman also did a great job choosing songs from Seeger’s vast repertoire and matching each tune with an artist ‘based on either the philosophical fit between the artist and the message of the song and/or their unique musical style’, as he writes in the accompanying booklet. As an example of this approach, take the opening track – ‘Where Have All the Flowers Gone’ – sung by Irish songwriter and peace activist Tommy Sands with Bosnian Vedran Smailovic (‘the Cellist of Sarejevo). Bear in mind that this was recorded in 1997, before the Good Friday agreement in Northern Ireland and only months after the lifting of the siege of Sarejevo. The album includes 37 versions of Seeger-related songs specially recorded by luminaries such as Bruce Springsteen, Jackson Browne, Billy Bragg, Sweet Honey In The Rock, Ani DiFranco and many others. The material is wonderful, every song reinforcing the picture of Seeger as both an interpreter of musical tradition and as a crusader for social justice. The performances are first-rate, with many highlights. Bruce Springsteen’s gentle reading of ‘We Shall Overcome’, for example, precedes the version he recorded for his album, The Seeger Sessions many years later, while Jackson Browne and Bonnie Raitt offer a lilting reggae-inflected account of ‘Kisses Sweeter Than Wine’. There are the songs that reflect Seeger’s later commitment to environmental issues and his campaign (entirely successful) to clean up his beloved, polluted Hudson river, such as ‘Sailing Down My Golden River’. If you live in a democratic country where the government is you, you cannot say, ‘I followed orders,’ ” she told a reporter. “If you recognize that something is wrong, you have to speak out to set it straight. In 1964 I took my youngest daughter canoeing on a beautiful lake in Maine. We camped on a little island and were dismayed to see the beach littered with bottles and cans. We picked ’em all up. I had a marker with me and wrote this graffiti on a flat stone. I never wrote a tune, but someone else can try. Just like we did when we swung from trees. Without being jailed or accused of treason. And the poor are left with crumbs from the table. And we can breath the air without having to choke. But as being threats to each other. And people, not profits, is what we hold dear. I’ll sing your story while I’ve breath within. Seeger is the only singer in the Rock and Roll Hall of Fame who was convicted of contempt of Congress. In 1955, he refused to testify about his past membership in the Communist Party. He had quit the party in 1949 though, he later admitted, should have left much earlier. ‘It was stupid of me not to…I thought Stalin was the brave secretary Stalin and had no idea how cruel a leader he was’. His conviction was overturned on appeal in 1961, but Seeger continued to be blacklisted by American TV networks until 1967. CBS censored parts of his anti-Vietnam War song, ‘Waist Deep in the Big Muddy’, when he sang it on the Smothers Brothers’ Comedy Hour. 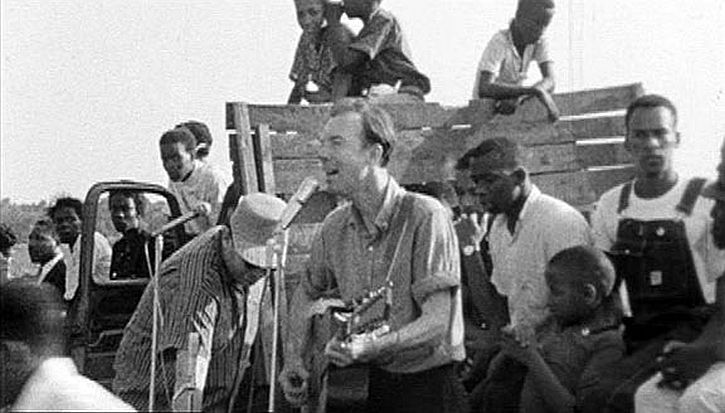 Poet Carl Sandberg dubbed Pete Seeger ‘America’s tuning fork’, and there’s little doubt that Seeger helped introduce America to its own musical heritage, devoting his life to using the power of song as a force for social change. He went from the top of the pop charts (‘Goodnight Irene’) to the blacklist and was banned from American commercial television for more than 17 years. In his nineties, Seeger continued to invigorate and inspire the musicians – most notably Bruce Springsteen, whose album We Shall Overcome – The Seeger Sessions was a tribute, comprising songs popularized by Seeger. Three years later, Springsteen persuaded Seeger to sing ‘This Land Is Your Land’ with him at Obama’s inaugural concert on the steps of the Lincoln Memorial. But on the other side …. it didn’t say nothing! He sang the song again last September in one of his last public performances at a Farm Aid concert in Saratoga Springs, New York state. 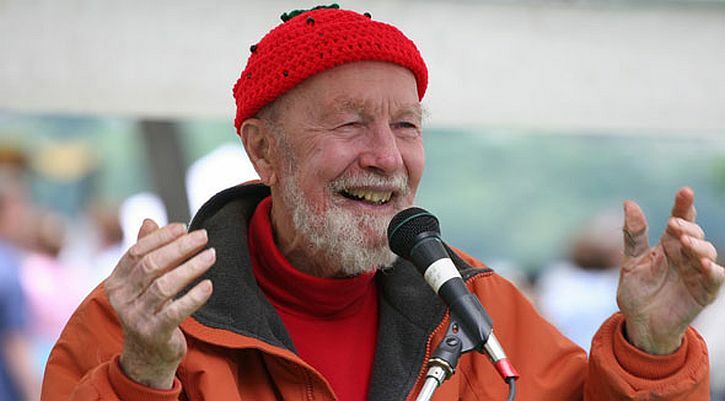 As well as Guthrie’s ‘radical’ verses, Seeger inserted another verse of his own that protested fracking in New York state – through the decades he has campaigned on environmental issues, leading a successful crusade in the 1970s to clean up New York’s Hudson River, which was so heavily polluted that there was nowhere on its course that was safe to swim in. He built a boat, the Clearwater, that travelled the Hudson River, drawing attention to the polluted condition of the river. He founded the Clearwater organization which supports environmental education programmes in schools and campaigns for tighter environmental laws. 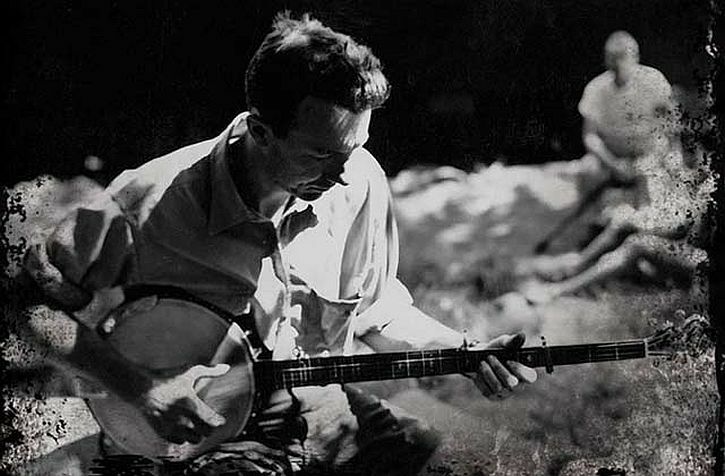 Pete Seeger came from a wealthy, yet highly politicised radical family. He was born at his grandparent’s estate in Patterson, New Jersey in 1919, the son of musicologist Charles Seeger and his wife, Constance de Clyver Edson Seeger, a violin teacher. Both parents could trace their ancestors to the Mayflower. His father was a pacifist during World War I whose pacifism, while teaching music at the University of California, cost him his teaching position. In the 1930s Pete was attending Harvard, hoping to become a journalist. In 1936, at a folk song and dance festival he heard a five string banjo for the first time and his life was changed forever. By 1938 he was passing out leaflets for Spanish civil war relief on the Harvard campus and had joined the Young Communist League. He left Harvard in the spring of 1938 without taking his exams. He went to New York where he found work with the Archives of American Folk Music. Seeger sought out legendary folk song figures including Leadbelly. 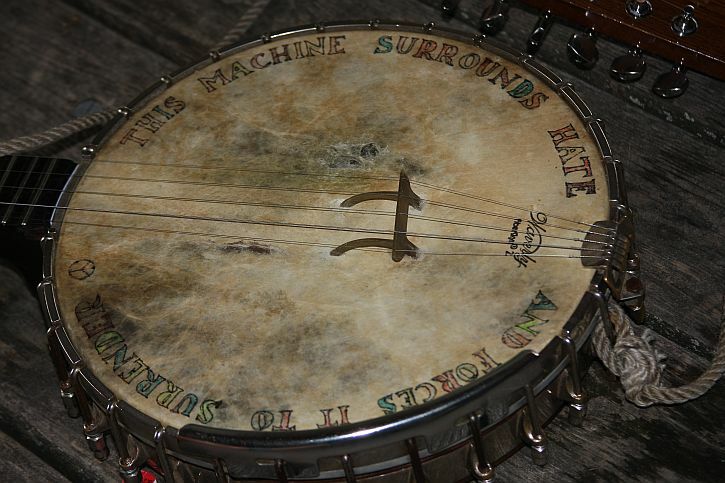 Inspired by these people and learning much about folk music, he began working with the five string banjo and soon became an accomplished player. In 1940, Seeger met Woody Guthrie and together they formed the Almanac Singers, a musical collective including Lee Hays, Millard Lampell, Sis Cunningham, Brownie McGhee, Sonny Terry and others. They recorded union songs, such as ‘The Talking Union Blues’ which they wrote as an organizing song, as well as pacifist songs. Drafted into the Army in 1942, the FBI was already building a file on Seeger because of his left-wing activities. In 1945, after his discharge from the Army, Seeger founded the People’s Songs collective but by 1949 it had gone bankrupt. On 4 Sepember 1949, Paul Robeson was scheduled to perform with Seeger at the Lakeland Picnic Grounds in Peekskill. A large mob of anti-communist vigilantes stormed the venue, attacking performers and members of the audience. While trying to drive away from the scene, Seeger’s car was attacked by vigilantes. His wife Toshi and their three year old son Danny were injured by flying glass. In the late 1940s, Seeger and Lee Hays wrote ‘If I Had a Hammer’. In 1950 Seeger, Hays, Fred Hellerman and Ronnie Gilbert formed the Weavers. They achieved great success, especially with their recording of the Leadbelly tune ‘Goodnight Irene’. However, blacklisting in the McCarthy era put paid to commercial success for the Weavers. During the 1950s Seeger occasionally performed with the Weavers but mainly paid the bills with his appearances on the college circuit, and with recordings for Folkways Records (including albums of songs for children, two of which our daughter would play repeatedly when young). In 1956, after writing ‘Where Have All the Flowers Gone?’ Seeger, Arthur Miller and six others were indicted for contempt of Congress by the House of Representatives. He was found guilty of contempt in 1961 and sentenced to ten years in prison. He was released from prison in 1962 when his case was dismissed on a technicality. During the folk music revival of the early 1960s, the TV networks occasionally invited Seeger to appear on folk music shows like Hootenany, but quickly dropped him when they discovered that he had been blacklisted. 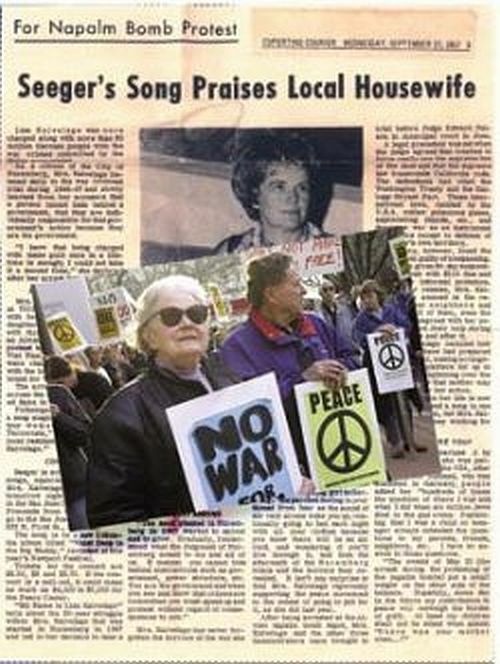 Seeger became involved in the civil rights marches in the South, both as a marcher and as a performer for the marchers. One notable occasion was at Greenwood in Mississippi in the summer of 1963 when there were voter registration drives underway in various communities, one of which was in Greenwood. On 2 July, Seeger performed at a SNCC rally before a small gathering of civil rights workers, singing ‘If I Had a Hammer’. Bob Dylan sang ‘Only A Pawn in Their Game’, written following the murder of Medgar Evers less than a month earlier, on 12 June. Seeger was strongly opposed to the Vietnam War. In September 1967 he appeared on The Smothers Brothers Comedy Hour on CBS-TV where he was scheduled to sing ‘Waist Deep in the Big Muddy’, an attack on the war, but the song was cut by the network censors. I have been singing folk songs of America and other lands to people everywhere. I am proud that I never refused to sing to any group of people because I might disagree with some of the ideas of some of the people listening to me. I have sung for rich and poor, for Americans of every possible political and religious opinion and persuasion, of every race, colour, and creed. It takes a worried man to sing a worried song…. He showed us how to do our time with grace, with a sense of history and honour, with a progressive vision for the ages, and a determination to embrace the next great cause because the good fight is never finished. It’s just waiting for a singer to remind us that: ‘The world would never amount to a hill of beans if people didn’t use their imaginations to think of the impossible’. So long, Pete. It’s been good to know you.